On my path to more natural-ness there have been a few things which have really taken some getting used to, such as taking cod liver oil each day and the taste of my salt/bicarb toothpaste. But one thing that definitely didn’t take any getting used to was my move to full-fat dairy. Life is just a little bit better since I have re-introduced my taste buds to full-fat cheese, full-fat yoghurt and started putting a bit of full-fat milk into my coffee each day (un-homoginized of course!). And today I made my first batch of full-fat homemade ice-cream and let me tell you, it was good. In fact, it was extremely good. It was even an instant hit with both the almost-4-year old and the almost-16-year old. This one is a winner. First a bit of background to why I decided to switch from low-fat dairy, the first reason was due to the amount of processing undertaken to get the fat out, as you know, I am looking to avoid processed foods. I then did some further reading and found that the butterfat in milk, which is the part we take out to make it low-fat, actually contains vitamins which your body needs to help you absorb the calcium, and other minerals that are in the milk. The butterfat also makes it much easier for your body to digest the milk. So butterfat is your friend. Now, I would not normally recommend that you eat your friends, but in the case of butterfat I make an exception. You should definitely eat butterfat. There are plenty of other reasons to stay away from reduced fat dairy, a google search with “low-fat dairy vs full-fat dairy” will get plenty of options for reading, but here is a quick article I found interesting from Dr Mercola called “Why you need to avoid low-fat milk and cheese“. Now back to my delicious ice-cream. My involvement in this ice-cream-making process took about 7 minutes in total, and the recipe only has 4 ingredients. But you will need an ice-cream machine to make this recipe. Well actually, you don’t need a machine to make the recipe, you just need a machine if you want your involvement to be around 7 minutes. 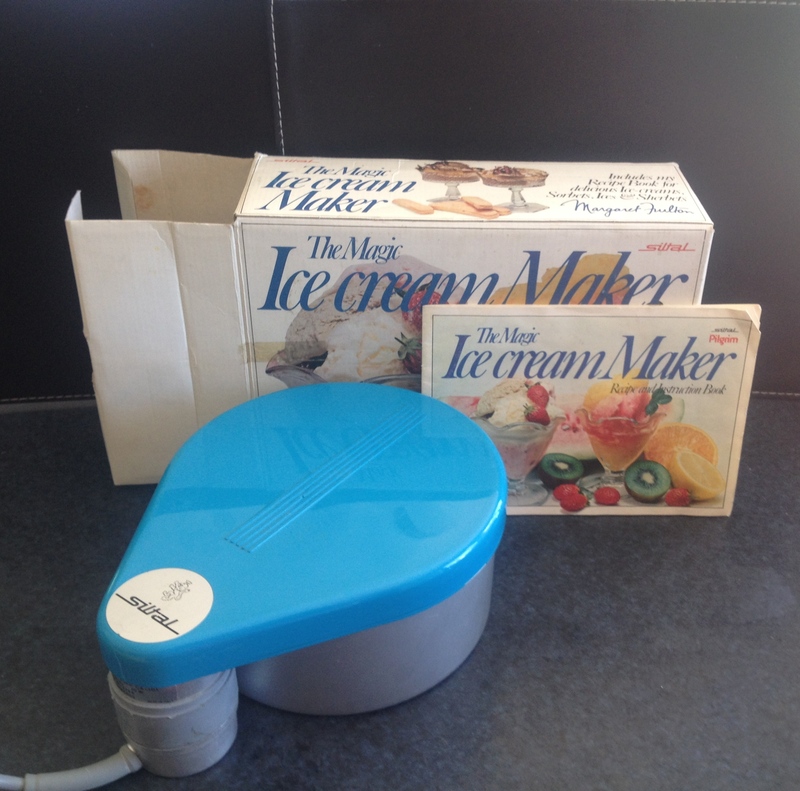 Without a machine, you will be the machine, which means you will need to stir the ice-cream regularly every half hour or so, over the take 2 – 3 hours it will take for the ice-cream to set. I had been on the hunt for an ice-cream machine for a while, as I don’t buy these types of appliances new anymore, and I finally hit the jackpot at the Green Shed . This little beauty is totally old-school, but I figure that just means it will probably never die. It cost me $5, and came in the original box with the original instructions/manual. Beat the egg yolks in a bowl and then mix in all the other ingredients. Then follow the instructions for your ice-cream machine. For mine, I just pop the mixed ingredients into the machine, place it in the freezer and turn it on. The machine mixes it until it is too thick to mix anymore, which took around 2 hours. You then remove the ice-cream from the machine, cover and leave to set for a bit longer. You can, of course, add all kinds of things to this basic recipe, like fruit, nuts or chocolate. (But if you go with chocolate, don’t tell Sally Fallon, she doesn’t do chocolate). Note: The original recipe from Nourishing Traditions includes arrowroot which I didn’t add, because I didn’t have any. I read that the arrowroot helps to make the ice-cream smoother, but mine is just fine and smooth without it so I wouldn’t bother putting it in next time. If you decide you want to include the arrowroot, you need to add 1 tablespoon for this recipe. 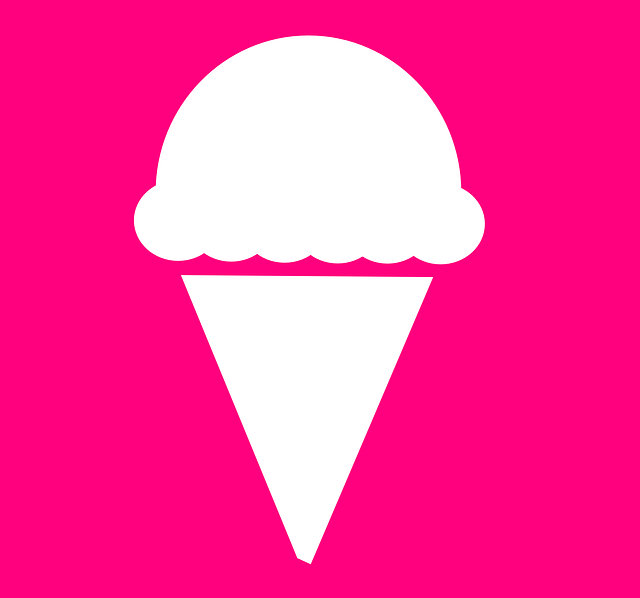 Categories: Food, Recipes | Tags: full fat vs low fat dairy, full-fat, home made ice cream, homemade sugar-free icecream recipe, ice-cream machine, maple syrup icecream recipe, Sugar free ice cream recipe | Permalink. OMG! Now I want ice cream!! I am sooooooo making this! I have a question, does this icecream stay creamy? 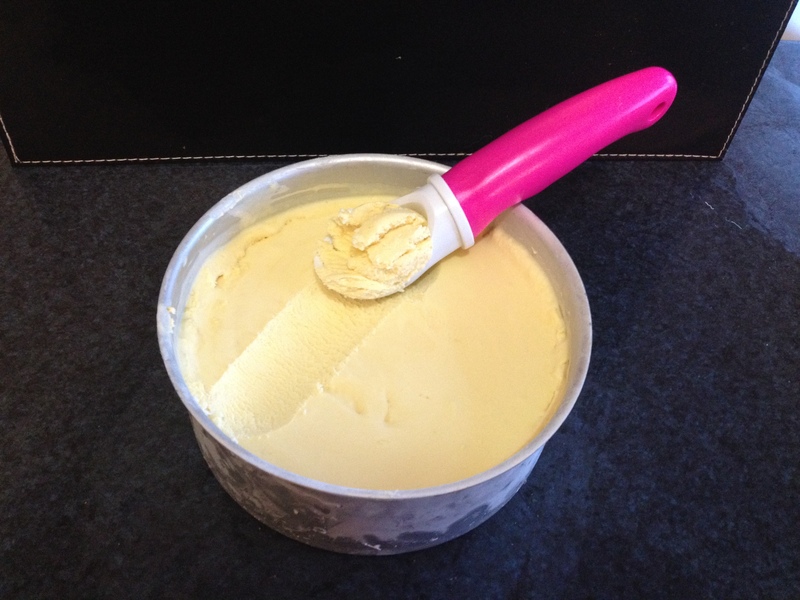 I was making icecream using coconut cream last summer but it would set quite hard so I had to let it defrost on the counter for a little while before serving it (or eating it straight out of the tub which was Dan’s preference….). I wonder if the egg yolks help to keep it soft? ?